Coya Come Home: A Congresswoman's Journey, by Gretchen Urnes Beito. Los Angeles: Pomegranate Press, 1990. Biographical information, congressional subject files and correspondence, copies of bills authored by Knutson, her Congressional Record inserts, correspondence and related materials documenting her campaigns for the Ninth District congressional seat, transcripts of her speeches, press releases, and newsletters. Her alphabetically-arranged congressional subject files. Political files (1954-1958) contain correspondence on her election to Congress in 1954 and problems relating to her failed re-election campaign in 1958. Correspondence, theses, book drafts, and research materials compiled by Gretchen Urnes Beito, a Thief River Falls newspaper writer, for her book Coya Come Home: A Congresswoman's Journey (1990). The papers focus on Knutson's congressional service and are dominated by Beito's files of research notes and related materials compiled for her book. Also included are extracts from letters and printed sources, copies of campaign literature, and newspaper clippings. MNHS call number: See the finding aid in the library (P2064). Coya Knutson, the first Minnesota woman to serve in the United States House of Representatives, was born Cornelia Gjesdahl on a farm in Edmore, North Dakota, in 1912. She graduated from Concordia College in Moorhead in 1934 with a degree in education. Soon after graduation she traveled to New York where she studied opera at the Juilliard School of Music. She quickly realized she had little chance of success in a music career and moved back to the Midwest. She settled in Oklee, Minnesota, where she married Andy Knutson, taught school, and ran a small hotel with her husband. By the 1940s she was serving in local offices and in 1949 the Democratic Farmer-Labor Party (DFL) encouraged Knutson to run for the state legislature. Her love of music and knowledge of the issues that affected the citizens of her district helped Knutson run an unconventional, but popular, campaign. After serving two terms in the state legislature (1950-1953), Knutson ran for representative in Congress. Self-determined and ready to make a difference for farmers at a national level, she ran against the DFL's endorsed candidate. 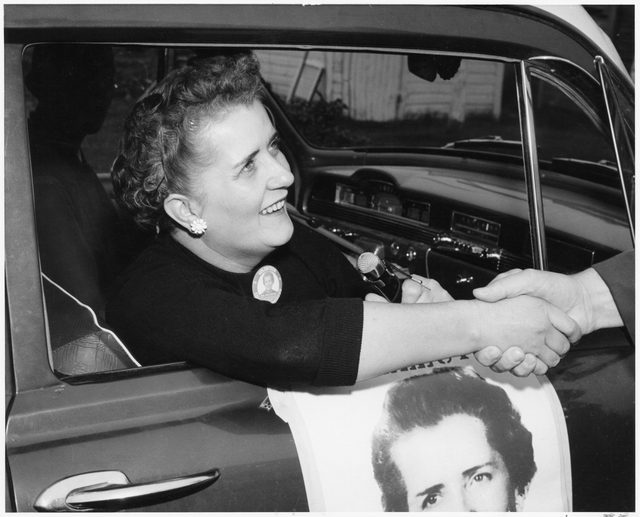 Her personal campaign style and knowledge of farming persuaded Minnesota's Ninth District voters to elect her to Congress, where she served from 1955-1958. Knutson quickly made a name for herself in Washington, where she let it be known that she ran her office, not the Democratic Party. Shortly after the party district convention in 1958 a widely published news release from her husband, in which he asked her to quit the campaign, hurt Knutson's re-election. Printed in newspapers around the country, the statement portrayed Andy Knutson as a neglected husband and hinted that Coya was having an affair. Despite a public statement from her husband that he had not written the famous letter, Coya was defeated for re-election. The mystery to the origin of the letter has never been solved. Some believe it came from high up the DFL ladder, while others argue local party officials wrote it. Almost everyone agrees now that Andy did not write it. Coya Knutson died in 1996. Her legacy as Minnesota's first female representative in Congress remains, as does the initiatives she pushed for regarding student loans, cystic fibrosis, and Minnesota farms.